YOU LIGHT UP OUR LIFE! IMAGINATION AND A PILE OF JUNK"
General Electric Company (GE) is a worldwide high-tech industrial. One of the worlds most successful and respected companies. 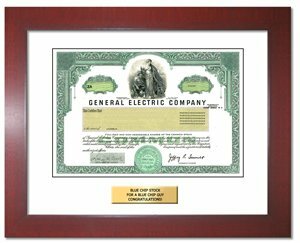 As of Nov 2016, GE stopped issuing paper certificates and registers ownership electronically instead. The recipient still becomes a shareholder with all associated rights and gets a replica for display purposes.